Philda Ngaujah narrated how her elder sister, Linda Ngaujah, died on Friday, 15th February, 2013, and her sister went to hell where she had encounters with demons and the devil. Sister Philda is a born again Sierra Leonean who for several years preached to her sister, Linda about her need to accept Jesus as her personal Lord and savior. 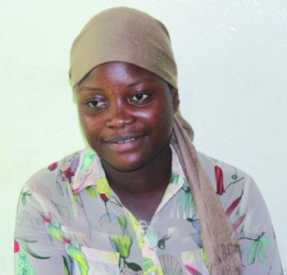 Linda on the other hand was a very wayward, nonchalant student of a higher institution in Sierra Leone; she paid deaf ears to her sister’s warnings until the death of a family friend when she kept hearing voices for days, warning her that she was going to die until she finally died. Linda died in a very mysterious circumstance in the hands of her younger sister- Philda. This is no fiction; it is a true life story. Read the account of the death of Linda by her sister who saw it all. Sister Philda starts her testimony with how she told her sister-Linda and some of her friends that God would put sinners in hell for eternity, they argued with her and tried to provoke her that God cannot put everyone in hell for eternity. According to her she cried and wept and told them, that God will prove Himself, then she went off to her place of work. “On Wednesday, 13th February, 2013, we went for the funeral of a family friend of ours, a young man, he died, he was a good friend of my elder sister- Linda- they were in the same thing! I looked at her and said, ‘the only thing you should do is to pray, it’s only prayer now that can save you. She said, I’m saying this thing and you are thinking it’s fun. She said a voice is saying to me, I’m the next to die. But her mood changed, she became quiet, she was not the normal Linda I used to know, she became quiet, she was doing things normally, but she was not saved. We went home… she was too quiet. On Thursday 14th February, 2013 (Valentine’s Day). In Sierra Leone, they even give holiday to celebrate it. They honor it. So, Thursday morning I was expecting my sister, I use to know to be on red, because that’s the color they use to celebrate it there- Red and White. She said, ‘Sister I’m going to die’. I told her to pray. One of her friends that they used to be in the world together called her, and told her to come for their party and she decided to go in order to ease her mood; and so she went, but didn’t stay there up to 30 minutes before returning. The Linda I use to know will not come back until we have slept. She kept on repeating that a voice said she would die when I asked her, her reason for not staying for the party. For the first time in my entire life, during a holiday like that my elder sister spent the whole day at home with me, we ate, we talked. On Friday morning, 15th February, 2013, I woke by 6am to wash for work. I heard Linda shouted from her room “Sister I’m dying, come and pray for me” she repeated it again, then I rushed into her room and I took my Bible and started praying. When I looked at her, she was on the bed, trying to reach to me, immediately she stood up, she fell back. The hands and the feet had no more life. It was then I knew she was really going to die. I began praying and remind God of the covenant He made to me concerning my family. White fumes began coming out of her mouth, I took water, prayed on it and gave it to her, but she was gargling. 9That was what God instructed me to do; it’s not that it was acceptable in the sight of Jesus). When she went to the bathroom, she was still tormented, then she demanded to lie down, I allowed her to lie on my lap in the sitting room. I continued praying fervently. “If you are outside there, don’t relent for your family, a day will come, that you will rejoice that everything you went through was for the glory of God. I kept praying but Linda insisted she would die, she breathed heavily and off, she went. I said, this is not possible, I kept praying (I was in sciences before I changed to commercial), we were taught that when someone goes off like that, you touch the pulse of the hand, for some seconds, if the person is not in coma, you will feel nothing). I touched and squeezed her hand, but felt nothing; I waited for hours, but felt nothing. I felt her nose to see if she was breathing, but she wasn’t, I shook her but felt no response. She was extraordinarily cold. Where are the True Men of God?